Several chinch bugs attack turfgrasses in North America. The hairy chinch bug (Blissus leucopterus hirtus Montandon) is the most common pest of northern turfgrasses, although the common chinch bug (Blissus leucopterus leucopterus Say) is occasionally found in cool season lawns. Infestations of southern chinch bug are often related to drought conditions or non uniform irrigation. Populations can often be brought under control by correcting non-uniform irrigation distribution and beginning regular irrigation. Population decline and turf recovery are usually the result of a combination of chinch bugs being infected with the fungus disease, Beauveria, and vigorous turf growth. Cultural Control Option 1: Since this pest requires hot dry conditions for optimum survival and reproduction, irrigation during the spring and early summer may increase the incidence of pathogen spread, especially the lethal fungus, Beauveria spp. Adults can withstand water because of the protective hairs on the body but the nymphscan be damaged by large water droplets. Cultural Control Option 2: The hairy chinch bug seems to prefer perennial ryegrasses and fine fescues, especially if these are in the sun and have thatch layers greater than 1/2". Bentgrass is also attacked but this turf is rarely used in lawns. 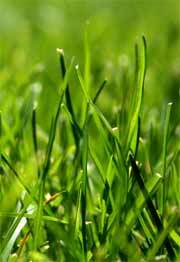 Bluegrass lawns with 50 percent or more ryegrass and/or fine fescue are the most likely to be attacked. In field tests, Yorktown, Yorktown II and Citation perennial ryegrasses are the most susceptible to chinch bug build up, while Score, Pennfine and Manhattan are avoided. Jamestown and Banner fine fescues are more commonly attacked than FL-1, Mom Frr 25 and Mom Frr 33. In general, perennial ryegrasses, fine fescues and tall fescues with endophytes are highly resistant to this pest. Cultural Control Option 3: Slightly damaged turf will recover quickly if lightly fertilized and watered regularly. Heavily infested lawns may have significant plant mortality because of the toxic effect of chinch bug saliva—reseeding will be necessary. Unfortunately, this often occurs when summer germinating weeds, especially crabgrass, are most active. Thus, additional controls for weeds may be necessary to reduce establishment of these undesirable plants. Chemical Control Option 4: Areas where chinch bugs have been a perennial problem, early insecticide sprays have been used to reduce the beginning spring population. This works well if applications are made in April or early May after adults have finished spring migrations and the young nymphs are just becoming active. It is highly recommended that preventive sprays be used only if sampling has been done to determine chinch bugs are indeed present. Chemical Control Option 5: Chinch bugs are easy to detect in turf and targeted insecticide applications can be applied to reduce populations which appear to be building to harmful levels. The best place to look is in hot, dry places on your property. These are the conditions chinch bugs prefer and where their populations are more likely to rapidly grow. However, they are very sensitive to vibration and will scurry if they sense your footsteps. Step lightly when approaching areas you suspect of harboring the bugs. If no damaged areas are currently present, it's pure luck to actually find the chinchbugs. Integrated-turf-management workers advise that a level of 10 to 15 adult chinch bugs per square foot is a treatment threshold. I have never seen such a high count except when chinch bugs were already damaging the turf. Thus, to prevent visible damage, you may need to use a lower treatment threshold. Avoid treating without first verifying the presence of chinch bugs through sampling.